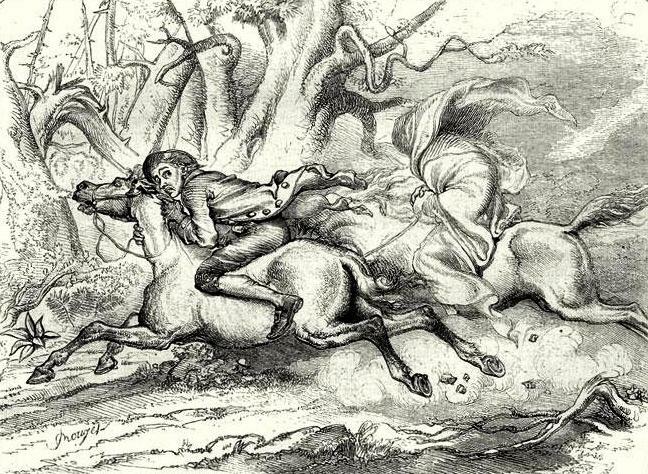 The Legend of Sleepy Hollow was published in 1820. It is featured in our collection of Halloween Stories. Such was the formidable rival with whom Ichabod Crane had to contend, and, considering, all things, a stouter man than he would have shrunk from the competition, and a wiser man would have despaired. He had, however, a happy mixture of pliability and perseverance in his nature; he was in form and spirit like a supple-jackyielding, but tough; though he bent, he never broke; and though he bowed beneath the slightest pressure, yet, the moment it was away--jerk!--he was as erect, and carried his head as high as ever. The mysterious event caused much speculation at the church on the following Sunday. Knots of gazers and gossips were collected in the churchyard, at the bridge, and at the spot where the hat and pumpkin had been found. The stories of Brouwer, of Bones, and a whole budget of others were called to mind; and when they had diligently considered them all, and compared them with the symptoms of the present case, they shook their heads, and came to the conclusion chat Ichabod had been carried off by the Galloping Hessian. As he was a bachelor, and in nobody's debt, nobody troubled his head any more about him; the school was removed to a different quarter of the Hollow, and another pedagogue reigned in his stead. Add The Legend of Sleepy Hollow to your own personal library.